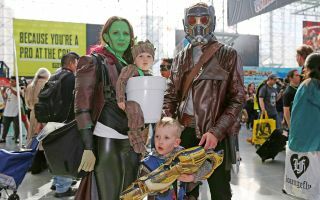 Fans at New York Comic-Con 2017 dress as characters from "Guardians of the Galaxy." The 2018 event runs from Oct. 4 through Oct. 7. New York fans of space and science fiction, get ready: It's time for New York Comic-Con 2018! While it was originally aimed at comics fans, New York Comic Con these days features panels on pop culture and nerdery of all stripes, often including beloved franchises for space fans as well as panels on the science of science fiction. And while NASA's not making an appearance this year, there are plenty of space-themed panels to see during the convention, which stretches from Oct. 4 to Oct. 7. Read on for Space.com's panel and event picks! This beloved spacefaring anime turns 20! This panel includes scriptwriters, a character designer and a mechanical designer for the show, who will discuss its legacy. (Fans with tickets for Anime Fest @ NYCC can also catch a behind-the-scenes panel Oct. 5. According to the panel description, "In 'Origin,' a group of outsiders seek a clean slate on a colonized planet but are jarred awake on their journey as an asteroid collision damages their spaceship, leaving them stranded. The abandoned passengers discover a terrifying truth and must work together for survival, but quickly realize that one of them is far from who they claim to be." This panel brings in Amy Ratcliffe, author of "Star Wars: Women of the Galaxy" (to be published Oct. 30, 2018), together with artist contributors to the book to discuss characters from across the "Star Wars" canon (and former canon). Creators, writers and surprise guests — I would assume actors from the shows — will discuss and offer sneak peaks of these two upcoming animated series, one of which follows a half-extraterrestrial teenager discovering her powers and the other a surreal nursing home floating through space. Join astrophysicist and science popularizer Neil deGrasse Tyson, theoretical physicist Brian Greene and others for "a wibbly wobbly, timey wimey evening of time travel, quantum states, wormholes, and more," according to the panel information. Because this show is on the Main Stage, you have to get in line earlier in the day — ideally, first thing in the morning — at the convention's Queue Hall to get a wristband for access to the evening event. Then get in line again that evening to get a good seat. Guillermo Del Toro helms this Netflix original series about royal teenage aliens fleeing a takeover; the panel will include Del Toro as well as the show's producers and actor Diego Luna ("Rogue One: A Star Wars Story"). This panel focuses on a new digital series from StarWars.com, "Our Star Wars Stories," which highlights "the power of Star Wars fandom." See the world premiere screening of the pilot for "Roswell, New Mexico," a reboot of the teen alien drama "Roswell" based the "Roswell High" book series. Afterward, there's a Q&A with the cast and creators. The cast and crew of the "Star Trek"-influenced comedy "The Orville" will discuss the show and share sneak peeks of Season 2. Series stars and producers will host a Q&A about the new drama series, which the panel description says "is based on the true, Top Secret investigations into UFOs and related phenomena conducted by the U.S. Air Force from 1952-1969." Science-fiction authors and editors lead a panel on how to add scientific accuracy to fiction without slowing down the action. It may take the patience of a Jedi master to bring kids to as crowded an event as Comic-Con — why not take the time to train them, too? From the event description: "All Padawans will be handed a real training lightsaber and taught the ancient battle forms and techniques from a true Jedi Master. Trainings are limited to 15 Padawans per each of the two half hour sessions, so sign up early!" A star-studded panel of authors featured in this year's "Best American Science Fiction and Fantasy" series, edited by N.K. Jemisin and John Joseph Adams. Besides those two, the panel includes Maria Dahvana Headley, Carmen Maria Machado, Matt Kressel and Charlie Jane Anders. According to the description, "Come hear these genre titans discuss the ever-expanding and changing world of science fiction and fantasy." Get a first look at the new line of "Star Wars" action figures and other toys from Hasbro. There's also a preview on Oct. 5 at 5 p.m. on the show floor stage, Booth 174. Watch the first episode live as it simultaneously premieres in the U.K.! After the screening, stay for a Q&A with Jodie Whittaker, who plays the latest Doctor, and the creative team. New York Comic-Con takes place over multiple locations, so be sure you have a good idea of where you're headed and leave enough time to get into each panel! The Javits Center, the convention's main location, boasts very long lines to get in at the beginning of the day, and individual panels will often have long waits for people who want to be sure to grab a seat. Main Stage panels require con-goers to get in a long line for wristbands ahead of time downstairs in the Queue Hall — ideally, first thing in the morning, as seating can run out — before showing up again before the panel starts. Prioritizing what you most want to see is key when it comes to Main Stage panels. The Hammerstein Ballroom and Madison Square Garden locations are both very large, but fans will often arrive early to get good seats or sit through earlier panels after waiting in line to get in. More information on all of this can be found on New York Comic-Con's website.